Thunderwear is a heat-resistant undergarment developed by the Swedish company Björn Borg to protect workers against burns in steel mills. The innovative fabric was inspired by Nomex used in spacesuits and developed with the European Space Agency's space technology transfer program. Steel mill workers facing dangerous sparks could soon benefit from a heat-resistant spacesuit fabric that protects astronauts during spacewalks. A new type of underwear called "Thunderwear" aims to protect workers (such as welders) from sparks generated as they do their jobs. The heat-resistant material was developed as part of a space technology transfer program at the European Space Agency. There are few fire-resistant undergarments on the market that can withstand typical temperatures of 1,922 degrees Fahrenheit (1,050 degrees Celsius). But before the creation of Thunderwear, none were available for women. Steelworker Cathrin Persson poses with an example of Thunderwear, heat-resistant undergarments that stops sparks from reaching the skin. 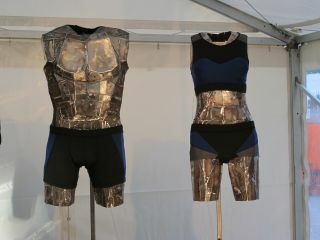 The novel fabric was developed with help from the European Space Agency based on spacesuit material technology. "When you're welding, there are sparks flying," Cathrin Persson, a Swedish steel mill worker, said in an ESA statement. "They fall down on you like rain. They make holes in your gear, and eventually, they get on your skin, where they don't stop until they run into something." Thunderwear makes use of Nomex, a flame-resistant fiber that has been used for firefighters and Air Force pilots in the past. The underwear prototype was developed by Swedish undergarment company Björn Borg, and was launched at a Stockholm fashion show a few months ago. The product idea came to be after a representative of ESA's technology transfer program, Cecilia Hertz, spoke to The Swedish Steel Producers Association, known as Jernkontoret. After discovering the shortage in the underwear market, Hertz got in touch with Björn Borg (who immediately said it would like to make it) as well as companies that work with the European space program to see what fire-resistant materials were available. The two firms contacted, the United Kingdom's STFC and Italy's D'Appolonia, both said Nomex would be a suitable material. The partners are now working to make this technology commercially available. No timeline for that has yet been released, but it has already drawn the attention of ESA astronaut Christer Fuglesang, who attended the fashion show and is an experienced spacewalker. "These things show how we can use space technology on the ground, and to change society," Fuglesang said.